With a superb linkage of Aberdeen, Plymouth and Laguna-Santa Catarina in Brazil, three universities have supplied the invaluable international flavour of marine biology. In a paper illustrating how bottlenose dolphins and shore-based mullet fishermen have and can cooperate, five researchers have opened doors for possible advances in the study of how learning enhances social behaviour. Tursiops truncatus is the bottlenose dolphin, foraging as dolphins love to do, with beach-casting fishermen. Some dolphins involve themselves while uncooperative individuals do not. Whether this difference led to social segregation within their fission-fusion system was the interesting raison d'etre of the whole research. Wild whale social learning seems to have been explained by this study, leading us to suppose that picking up ideas from your friends leads to the use of such behavioural adaptation in novel situations. This all takes place in Laguna bay in the south of Brazil - There are lots of examples of such unique foraging in animal societies. 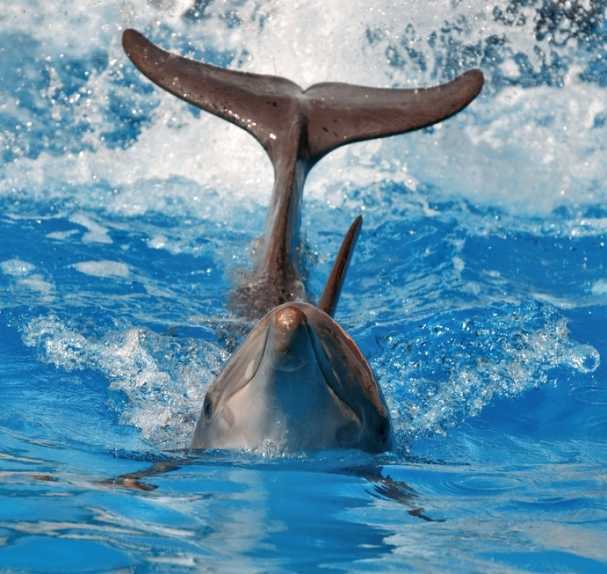 Tursiops is a genus of dolphins that exhibit great "ecological plasticity" in the words of the authors. Even within the small (only 35 individuals were studied) populations you find in places such as Laguna, the locals' mullet fishing season involves some dolphins and not others. A similar interplay is known in the mouth of the Irrawaddy, where the rare Irrawaddy river dolphin has a mutualistic relationship with Myanmar fishermen, where both partners increase their fishing success rate. In Laguna, the mullet are driven by the dolphins towards a line of fishermen to whom they signal with head and tail slaps. The fishermen then know where to cast their nets. One or more dolphins are involved, but research is needed to see how they cooperate among themselves in the herding of the fish. The fishermen certainly know how to cooperate and the history of the habit stretches back to at least 1847. Dolphins that slapped their head ot tail or drove prey schools towards the beach were classified as cooperative individuals, while if they displayed neither of these behaviours, they were classed as uncooperative. In a school (dolphins within 50m of each other, engaged in similar behaviour), individuals, excluding calves, were identified with photographic records, providing the research with 16 cooperative and 19 uncooperative dolphins. One dolphin stands out in the research as cooperating occasionally but socialising within both groups of cooperative and uncooperative animals. The scientists refer to him as a "social broker." It is very sad that individuals normally never get a mention in research, even when they stand out so significantly. Not in this case. F. G. Daura-Jorge, M. Cantor, S. N. Ingram, D. Lusseau and P. C. Simoes-Lopes performed the work from 2007 to 2009 in the two lagoons that give the Brazilian city its name. They publish their study: The structure of a bottlenose dolphin society is coupled to a unique foraging cooperation with artisanal fishermen, today, in the Royal Society journal, Biology Letters.